Army of Darkness: Old School Average 0.00/5 - out of 0 total votes. Collects Army of Darkness Vol. 1 5-7 and Tales of Army of Darkness! Return to the grueling horror of the Army of Darkness movie trilogy with this explosive new collection of the OLD SCHOOL storyline from the Army of Darkness series by writer James Kuhorik and artist Kevin Sharpe! 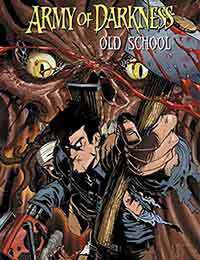 Plus: this special collection also includes the TALES OF THE Army of Darkness MONSTER SIZED ANNUAL featuring 48 pages of all out horror and action from the Army of Darkness - 5 fantastic and terrible tomes by the following creative teams: Shawn Spurlock and Paul Azaceta, James Kuhoric and Nick Bradshaw Jim Kuhoric and Filip Sablik, Robert Napton and Michael O'Hare...And special guests... Robert Kirkman and...Ryan Ottley! Also includes a cover gallery from Old School and the Tales Annual!